Last week Desert Boy and I had the opportunity to visit the Great Basin Museum in Delta, Utah. It's located at 328 West 100 North. It has both an outdoor area and a covered museum. The building used to belong to the telephone company. Inside a sign mentions some of the displays and those who are responsible for making these exhibits possible. 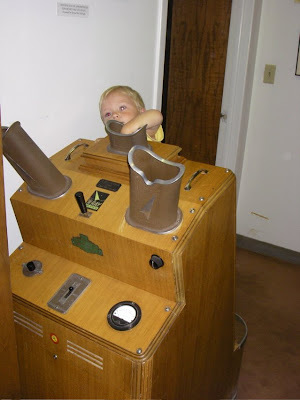 One of the things that Desert Boy first had fun with was an old X-ray machine that was used at a shoe store to help size shoes. It makes you wonder what we are doing today that in 50 years we'll shake our heads about. Desert Boy wasn't quite tall enough to look down and see his feet, but he was still entertained. With Desert Boy's fascination with trains, he thought the photos of trains were great. There used to be a lot of railroad tracks around Delta to reach the sugar beet fields. Alas, this was a short-lived venture, with a bad virus attacking the beets only about four years after production. 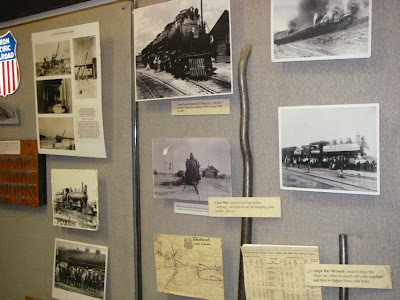 Soon the museum will have a corner dedicated to a small train--something we'll have to go back to see! Desert Boy was momentarily entertained by this display about farming. 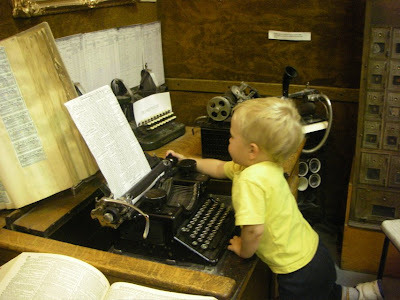 And then he found a typewriter and started typing. With permission and supervision! LaWanna Peterson gave us a tour of the museum, and she was super. She said she had a great-grandson Desert Boy's age, so she was very patient with his energetic ways. She also let him sit in the seat at the dentist's office display. 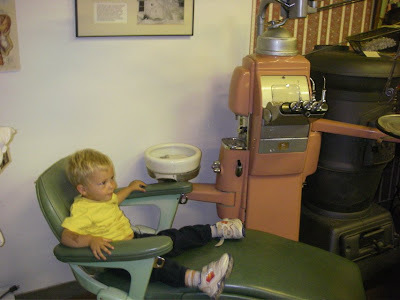 I'm not sure he would have enjoyed it quite so much if he had to experience some of the older dental tools, though. 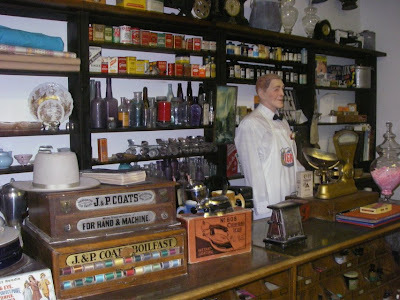 A storefront display was packed with old time merchandise. 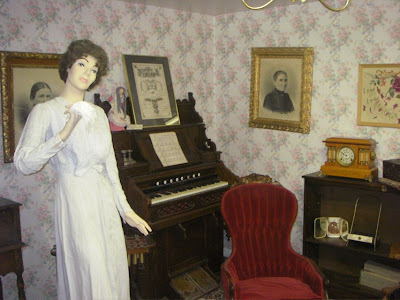 And a decorated parlor gave a taste of what life was like in the early days. 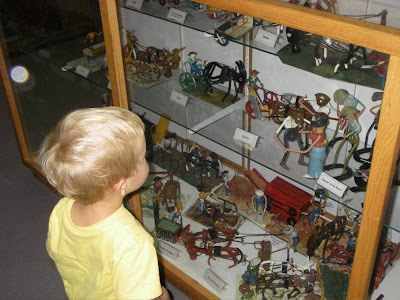 There were many more displays showing life in earlier days, with a classroom, woodworking shop, hospital gurney, and more. 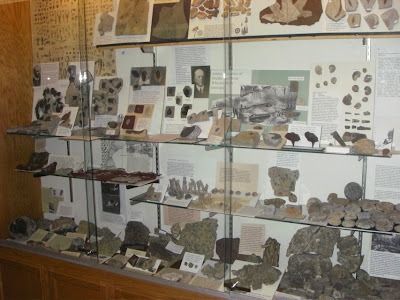 Another part of the museum was focused on rocks and minerals. 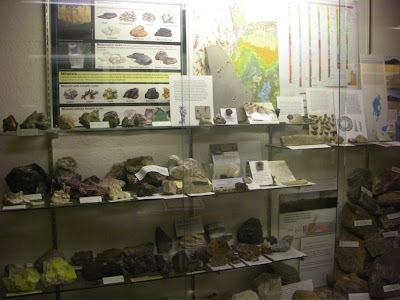 The area around Delta (and for that matter, most of the Great Basin), is rich in rocks and minerals. They had many great examples of trilobites. I'm always amazed at how many different minerals can be found in the area. One corner has a display where a black light can be turned on. It was really cool. Then we headed outside. 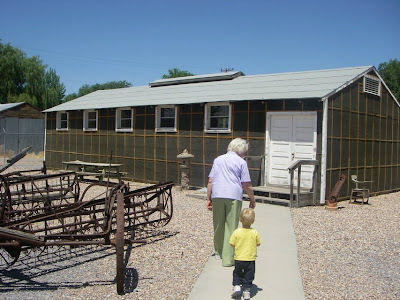 Our first stop was one of the bunkers from the Topaz Internment Camp. This "camp" was located about 13 miles from Delta and was used during World War II to house American citizens of Japanese descent. I was overwhelmed by how many people they had living in such a small space--Topaz was the fifth largest city in Utah while it was occupied. Another day we'll go out to the Topaz site, but for now, if you'd like more information, click here. 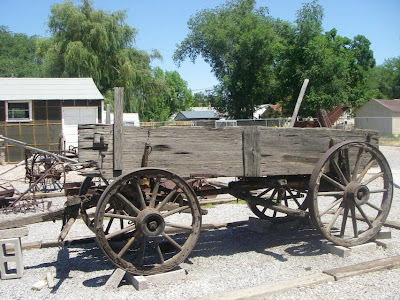 Also outside was a variety of old equipment and machinery. Trying to imagine bouncing over the hard ground in this Conestaga wagon made me sore. 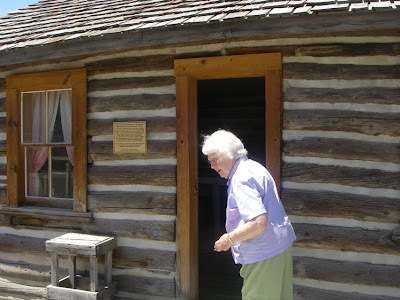 We also got to see the inside of a pioneer cabin--a one room cabin for a family of eight. That would have been one close family! 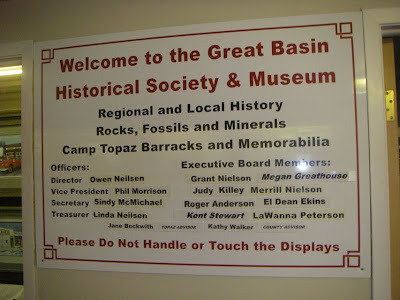 The Great Basin Museum has something for everyone. During the summer, it's open from 10 am- 4 pm Monday through Friday, and on Saturday from 1 pm - 4 pm. Winter hours vary, and you can call 435-864-2759 to get current information. 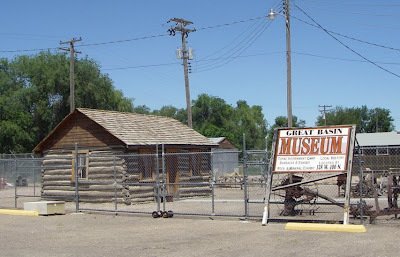 The Great Basin Museum has plans to expand and move to main street, where visitors will be able to find it more easily. 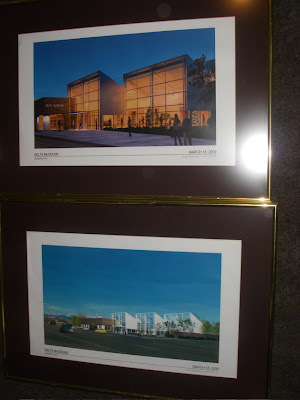 Topaz Museum and Daughters of Utah Pioneers are slated to have their own exhibit halls, while the chamber of commerce would be located near the main entrance. The museum is looking for funding to make this dream a reality. 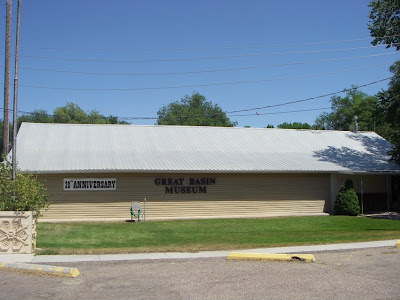 You can learn more about the Great Basin Museum on Facebook and at the Great Basin National Heritage Route website. I did an oral report on Topaz in Jr. high, my grandpa(J.A.D.) 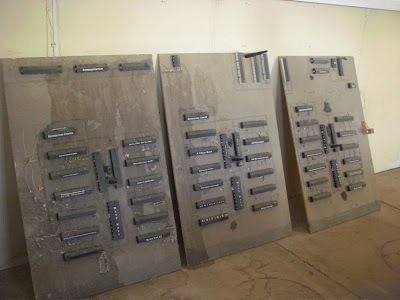 worked on the supply train for the camp. The uncomfortable thing was after I gave my report a boy in my class gave his report about his grandpa being in the camp. Talk about things from the past we shake our heads about! 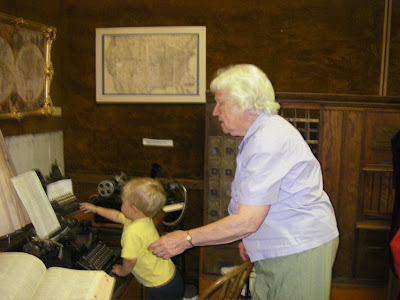 My kids need to see a typewriter, they have no clue and it makes me feel old.